Roofing Company | Brandon, FL | Dynamic Roofing Concepts Inc. 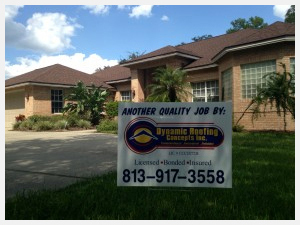 Dynamic Roofing Concepts Inc. is a family owned and operated company that offers affordable and high quality roofing in Brandon FL as well as Tampa and nearby cities. Our company was built on a foundation of honesty, integrity, professionalism and dedication, and throughout the 40 plus years that we have been in business we always make sure that every job we do is focused on that mission statement. In addition to being one of the most experienced companies that specializes in metal roofing in Tampa and Valrico, we also strive to be one of the most knowledgeable. While we specialize in several different types of roofing in addition to roof repair, we make sure that we take to time to get to know our customers and exactly what they want when it comes to roofing services. Since not every roof is the same, not every roofing job is going to be the same. Don’t hesitate to get in touch with us if the roof of your business needs some work as we also specialize in commercial roofing services in Plant City, Carrollwood, and the neighboring areas. Don’t wait until you have a roofing emergency to call Dynamic Roofing Concepts Inc., a professional roofer – prevention is always the more and preferable and oftentimes more affordable option. For more information or to schedule an appointment with one of our knowledgeable and certified roofers, give us a call at 813-657-7663. Let us put our experience and history to good use on your residential or commercial roof.